These unfortunate incidents happen to everyone and are just twists and turns in the coaster ride. You can’t truly appreciate the good without some of the bad. Sure there are always going to be people that have it better than me but there will also always be people that have it worse. With just over 7 Billion people on earth you have a much better chance of winning the lottery twice than being the person that has it the absolute best or the absolute worst. What has me thinking about this today is two events. My youngest daughter having an MRI today to finalize whether or not she will need growth hormone injections due to a deficiency and my Dad having colon surgery tomorrow. Both instances would probably freak most out big time but my oldest daughter has already been taking growth hormone for years and my Dad already survived triple bi-pass surgery years since past. Welcome to the silver lining that turns to gold. You have to appreciate what you have. Being 42, my life could very well be close to half over. 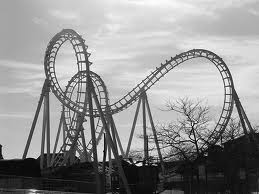 You have to appreciate the upswings of the ride or the downswings will dribble your life away with you not even noticing. Welcome to my pick you up post. What do you mean it’s not working? Thanks for being my unknown therapist and reading through my blog today. You will probably be the one view in my blog stats that I check later this week. One is better than none. Yes, I still stick to optimism like duck tape sticks to scorpions. Never mind, that analogy is just for us desert dwellers. Yikes! Medical things scare the stuffing out of me, so it’s encouraging to read your ‘such is life’ outlook. Thanks for sharing! And hope all goes well with your daughter and dad! Thanks for the comment Lynette. Medical things used to scare me a lot more years ago. I guess I have just gained a thicker skin over the years but my positivity has always helped too.